Stir-Fry is always tasty, but this one comes with a bit of a fruity twist! When we got back from GenCon, we were excited to talk about all the games we saw and played. Of course we ate a lot of food there too…but we didn’t make any of it. 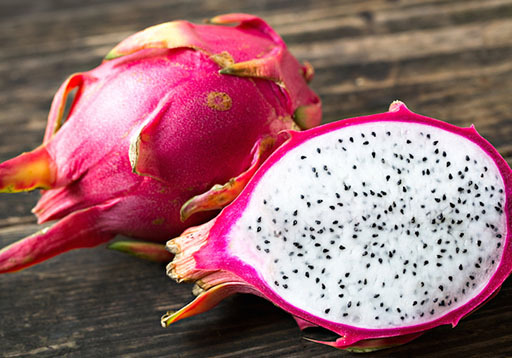 So, we picked a few recipes with a common theme – dragon fruit – because GenCon always uses images of a dragon. It’s kind of their mascot. If you make this Dragon Fruit Stir-Fry, we want to know what you think! Post pictures on social media and tag us! Peel and cut dragon fruit into bite sized cubes. Stir together, in small bowl, reserved juice, water, 1/3 cup soy sauce, 1 tablespoon cornstarch, red pepper (if desired) and garlic powder; set aside. Combine chicken with remaining 1 tablespoon each cornstarch and soy sauce, in medium bowl. Heat oil in wok or nonstick large skillet over medium-high heat. Add chicken and stir-fry 4 to 5 minutes or until lightly browned; remove. Add broccoli, bell pepper, carrot and ginger; stir-fry 4 minutes or until just tender. Add reserved soy sauce mixture and chicken; cook, stirring, 2 to 3 minutes or until sauce boils and thickens. Stir in pineapple chunks and dragon fruit and heat through. Serve over rice.